What We Lost: Remembering Vietnam 50 Years Later W&L alumni look back at the Vietnam War and how it changed them. Three dozen members of the Class of 1967 crowded the stage in Stackhouse Theater on Alumni Weekend this past April. As the audience looked on, retired Navy SEAL Bill Wildrick ’67 thanked each man on stage for his service, presented him with a black-and-gold pin, and gave him a crisp salute. The occasion commemorated much more than a 50th class reunion for these alumni — it marked a half-century since they were forced to face a future they could not have anticipated as happy-go-lucky teenagers. The United States’ official commemoration of the 50th anniversary of Vietnam stretches from 2012 to 2025. Although W&L does not have detailed records of the number of alumni who served, many classes that have already celebrated a 50th reunion, and some that have yet to reach that mark, are likely to include Vietnam veterans. Dr. William Sledge ’67, a psychiatrist who studied the effects of imprisonment on Air Force POWs during and after Vietnam, took part in a panel discussion with other veterans that preceded the pinning ceremony at W&L in April. Later, he noted that while some veterans still prefer to leave their stories untold, many have grown increasingly comfortable reminiscing as the decades have passed, particularly with their families and one another. As the situation escalated, however, plenty of students began to feel anxious. Many had already planned to attend graduate school, get married, or both, which could result in a temporary deferment prior to the draft lottery of 1969; those who hadn’t considered those options began to regard them with greater interest. Still others had medical deferments, and there were a few conscientious objectors. Bruce Rider ’66 went through Air Force Officer Training School (OTS), but not before facing a dilemma: He had already started classes at Princeton Theological Seminary when he got the call about his application to OTS. Most of his fellow students at Princeton wanted to stay safely ensconced there, but every generation of Rider’s family, dating back to the Revolutionary War, had served in the military. 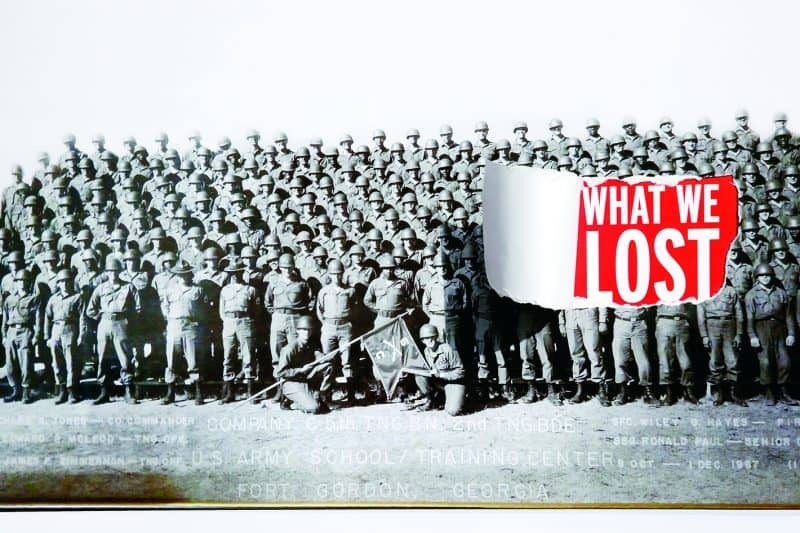 It is estimated that 25 percent of the forces in Vietnam were drafted, and that included some W&L alumni. 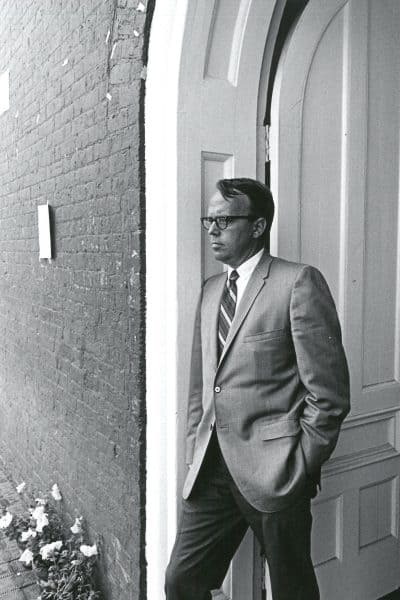 One of those men was Walter “Buddy” Nicklin ’67, who considers himself fortunate because he was sent to Europe to work as a chaplain’s assistant and never made it to Vietnam. On the occasion of his 50th W&L reunion, he wrote an essay for the May 5, 2017, edition of The New York Times, recounting the personal anxiety and moral questioning that the draft created for him. Barry Crosby, the young man who sat in the glow of that fraternity house TV with Jones as they watched the news, was not so fortunate. Jones was on a U.S. Navy ship in the Gulf of Tonkin when he found out that Crosby had been killed. He was one of 18 W&L alumni who died in Vietnam. Jim Oram’s mother pins on his lieutenant’s bars on the W&L front lawn on Commencement Day 1967. Mac Holladay (second from left) with fellow Navy pilots. Holladay served in Vietnam as a search-and-rescue pilot. Mac Holladay ’67 in the cockpit of his plane. Holladay served in Vietnam as a search-and-rescue pilot. Bruce Rider ’66 served as an Air Force intelligence officer in Vietnam. Walter “Buddy” Nicklin with his basic training unit. Nicklin is in the second row from the back, fifth from the left. The Vietnam War was a frustrating and difficult one to fight, in an inhospitable climate with unfamiliar terrain. The cultural divide between Americans and Vietnamese made it harder to distinguish friend from foe. Guerrilla warfare made for a particularly deadly and dirty fight. Washington and Lee alumni were among the men who put their lives in danger for a war that sometimes felt pointless. They went on intelligence-gathering missions, set up ambushes, marched through jungles pocked with punji pits, and watched comrades impaled on sharpened, feces-covered stakes. They dodged bullets, rescued airmen from downed planes, and had their Jeeps blown up by kids with C-4 explosive. That’s merely a sampling of the tales they tell, which are usually short on the most troubling details. Of course, it does not begin to encompass the memories that will stay buried in gray matter for the rest of their lives. When these soldiers came home, it was not to the victory parades and hero worship with which World War II veterans were met — it was to a country that was deeply divided over the war, and that offered few support systems. Veterans were alternately spit upon, goaded into fistfights, and ignored. As a result of his experience as an Air Force intelligence officer, Rider went legally blind within a year of coming home. Other fallout from the war included a lost job and a failed marriage, and he remembers feeling incredibly alone. Some vets also harbor feelings of guilt for reasons they may or may not be able to articulate. “I can tell you that goes all the way up to guys who won the Medal of Honor but feel guilty because they survived and the other guys didn’t,” Oram said. “Others feel guilty because they didn’t get into combat. I’m in the middle: I did what I did and I survived, and I feel guilty that I couldn’t do more. No matter their military branch, service experience, or political leaning, most of the alumni veterans interviewed for this article said that the war, as difficult as it was, spit them out as better people than they had been when they went in. They seem to share a lifelong desire to serve their communities and their country. Holladay, haunted by an image of naked, hungry children picking over a garbage dump in Indonesia, remembers thinking, “If I can get home safely, I want to try and make sure nobody in my hometown of Memphis is ever looking for something to eat.” He devoted his entire career to community and economic development not only in Memphis, but also across the nation. Sledge continued his research with POWs and became one of the first psychiatrists to publish on what is now known as post-traumatic growth. Rider is involved in multiple civic activities, including veterans’ organizations, fraternal groups, the historical society, and his local library. Jones is a Pulitzer Prize-winning journalist. Wildrick became an instructor who helped to set up reserve SEAL support commands on the East and West coasts, providing the closest link between active and reserve forces in the 30-year history of the Naval Special Warfare Reserve. Oram has served on the board of directors for the child services organization that arranged his own adoption when he was a baby. He is also an elected supervisor in his township, and is involved in the local veterans’ organization and other nonprofits. “I realize even more, now that I’ve started talking about Vietnam, that my whole life has been building toward this crescendo of service,” he said. Washington and Lee has worked with alumni to create opportunities for Vietnam-era graduates to return to campus and reconnect over their shared experiences. In 2009, the university held a well-attended Alumni College program titled “Vietnam: A Retrospective.” This year’s Alumni Weekend panel discussion, which featured Holladay, Sledge and Oram, along with historian and author George Herring, brought veterans together to reminisce about both the war years and their W&L careers. The Alumni Magazine welcomes additional memories from W&L alumni about the Vietnam War Era, and may publish some of those comments in a future issue or on the website. Whether you went to Vietnam or not — and for any reason — we are interested in hearing about your experience. Please email us at magazine@wlu.edu. 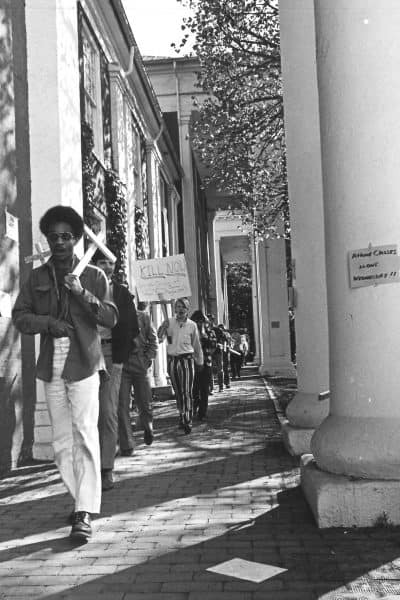 Wednesday, May 6: While many students attend classes as usual, 30 to 40 picket on the Colonnade for two hours. About 200 students travel to a rally in Charlottesville. The student body president, Marvin “Swede” Henberg ’70, calls for a student assembly on May 8. Thursday, May 7: Concerned students meet with Huntley to request relief from academic schedules to participate in the student movement. About 100 students gather in the Cockpit, as the University Center tavern was known, for an open forum. This results in a resolution to close the university for the year so students will be free to participate in national events. The faculty declines to cancel classes but allows students to submit a request in writing and receive an incomplete grade until Sept. 30, when the “I” will be replaced by an “F” if work is not completed. Friday, May 8: About 900 students meet in front of Lee Chapel, where Henberg presents the resolution and invites discussion. The vote is postponed until Monday. 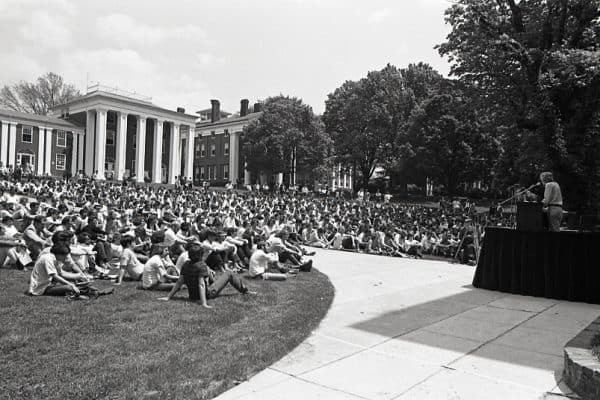 Students gather on the lawn during “Eight Days in May” 1970 to hear student body president Marvin “Swede” Henberg ’70. Saturday, May 9: Reunion Weekend (and the annual Alumni Association meeting) takes place. Many students travel to Washington for large demonstrations, while others, half-dressed and unshaven, hang around in tents they’ve pitched on campus. Students and alumni engage in constructive discussions about the war, and alumni praise Huntley for his handling of the previous week’s unrest. Sunday, May 10: Students hold a memorial service in the University Center (now Evans Hall) for the four students killed at Kent State. The SEC endorses the resolution to close W&L but wants students to be able to continue classes if they wish. Debate continues into the evening. Monday, May 11: Some 78 percent of the student body votes to cancel classes, retroactive to May 6 and through Fall Term. Faculty gather that evening, and many express sympathy for the student viewpoint. Some support university closure, but Huntley refuses, citing obligations to the trustees and university charter to keep the school open. Instead, faculty reiterate their action of May 7, saying students who wish to take incomplete grades must inform them in writing by May 21. Upset students boycott classes. Tuesday, May 12: Students hold an assembly on the Front Lawn at 8:45 a.m. and read a statement condemning the faculty motion. Huntley holds a student assembly at noon, during which he assures students that ‘lack of agreement” from the faculty and administration does not equal a lack of concern. “I must say I believe you have succeeded in bringing this student body into a sense of community, a sense of willingness to talk, a sense of willingness to share deep conviction, a sense of dedication to something higher than self,” he tells them.